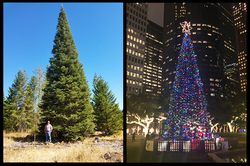 Stephen F. Austin State University forestry alumnus David Robinson had the honor of selecting the official Christmas tree for the City of Houston. The tree, a 65-foot white fir harvested from private timberland near Medford, Oregon, was lit during Houston's 99th annual Mayor's Holiday Celebration and Tree-Lighting Ceremony at City Hall on Dec. 3. Pictured, Robinson, field supervisor of urban forestry for the City of Houston, stands with the tree prior to felling. NACOGDOCHES, Texas - As a final countdown commenced, attendees at Houston's 99th annual Mayor's Holiday Celebration and Tree-Lighting Ceremony at City Hall turned their attention to the event's centerpiece - a 65-foot-tall white fir tree located in Hermann Square. Although not cloaked in purple lights and Lumberjack regalia, the Christmas tree standing in the heart of Texas' largest city holds a distinct connection to Stephen F. Austin State University. Earlier this year, Nacogdoches native and SFA forestry alumnus David Robinson traveled to Southwest Oregon to hand select the towering tree destined to become the cornerstone of Houston's holiday celebrations. "It was an honor, and I hope I get to do it again," said Robinson, field supervisor of urban forestry for the City of Houston. "I got to see a part of the country I've never seen before, and it's just amazing." "The trees are marked with GPS coordinates, and he returns during the next five to six years to fertilize and shape the tree," Robinson said. "Once ready, the trees are marketed to cities like Houston, shopping malls or anyone in the market for a big Christmas tree." "We check things that don't translate well through email and pictures, such as tree quality and different kinds of potential hazards," Robinson said. "Despite the size, aftercare is not too dissimilar from the way in which families care for their own live Christmas trees at home," Robinson said. According to Stella Pereira, office manager for the Mayor's Office of Special Events, more than 3,000 individual LED lights adorn the tree. Although the final honor of lighting the tree went to Houston Mayor Sylvester Turner, Robinson said his own family has a tradition of selecting and decorating a tree to look forward to. He added his family's Christmas tree will, of course, be a live tree.